Crochet: IN and AROUND stitches. Go to original pattern for design DROPS 177-28. 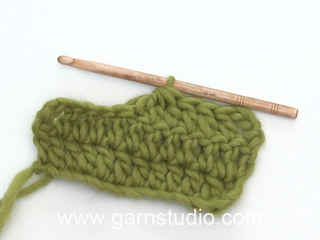 DROPS CROCHET Hook size 4.5 mm/US 7 – or size needed to get 16 single crochet/double treble crochets = width 10 cm / 4''. 1 repetition with A.6B measures approx. 5.5 cm / 2 1/4'' in width. 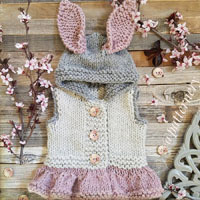 You can get the yarn to make this pattern from	28.60$. Read more. See diagrams A.1 to A.6. At beginning of every round/row with single crochet begin with 1 chain stitch, this does not replace first single crochet. 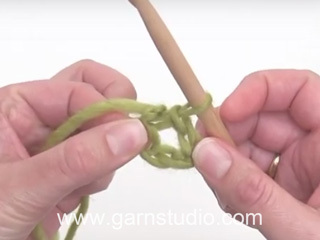 When working in the round, finish round with 1 slip stitch in chain stitch. At beginning of every round/row with double crochets replace first double crochet with 3 chain stitches. When working in the round, finish round with 1 slip stitch in 3rd chain stitch. At beginning of every round/row with treble crochets replace first treble with 4 chain stitches. When working in the round, finish round with 1 slip stitch in 4th chain stitch. Work 3 treble crochets together into 1 treble as follows: Work 1 treble but wait with last yarn over and pull through, work 1 more treble the same way, work 1 more treble but now pull last yarn over through all 4 loops on hook. Work 3 double treble crochets together into 1 double treble as follows: Work 1 double treble but wait with last yarn over and pull through, work 1 more double treble the same way, work 1 more double treble but now pull last yarn over through all 4 loops on hook. Make 4 yarn overs on hook, get the yarn under chain space, * 1 yarn over on hook, pull yarn through the 2 first/next loops on hook *, repeat from *-* 5 times in total = 1 loop on hook. Work 3 triple treble crochets together into 1 triple treble as follows: Work 1 triple treble but wait with last yarn over and pull through, work 1 more triple treble the same way, work 1 more triple treble but now pull last yarn over through all 4 loops on hook. Worked in the round from mid back on the back and outwards. Work 6 chain stitches on hook size 4.5 mm/US 7 with Cotton Light and form a ring with 1 slip stitch in first chain stitch. Work in the round according to diagram A.1. After 2 round in A.1 continue as follows: Work A.2 1 time, repeat A.3 3 times in total, finish with A.4. Continue in the round like this. REMEMBER THE CROCHET GAUGE! 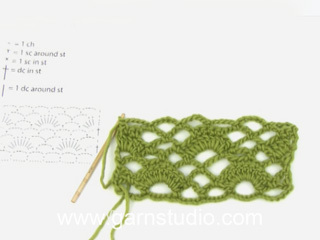 When square is done, there are 54 treble crochets along each side and 6 chain stitches in each corner. Square measures approx. 34 x 34 cm / 13½" x 13½''. Cut the yarn. Now READ CROCHET INFO and READ THE REST OF BODY BEFORE CONTINUING. Begin in a corner, then work in the round as shown in A.5, i.e. * work A.5A 1 time, repeat A.5B until 4 stitches remain before next corner, work A.5C 1 time *, repeat from *-* 4 times in total. NOTE: Round marked with star in diagrams shows last round on square (A.2-A.4), this round has already been worked. 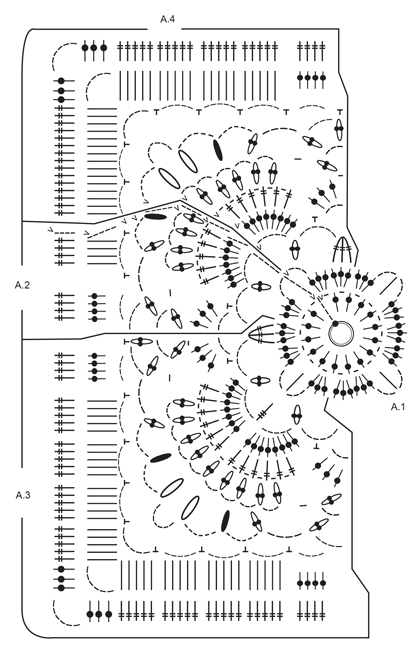 To make the pattern fit with correct number of chain spaces and repetitions onwards, the rounds marked with arrow in diagrams must be adjusted to correct number of double crochets as explained below. Arrow-1: Adjust number of stitches to 74 double crochets along each side including double crochets in corners (i.e. work approx. 4 double crochets around each chain space - number of stitches should be divisible by 10 + 14). Arrow-2: Adjust to 94 double crochets along each side including double crochets in corners (i.e. work approx. 4 double crochets around each chain space - number of stitches should be divisible by 10 + 14). When A.5 has been worked 1 time vertically, repeat the last 4 rounds in A.5 upwards. AT THE SAME TIME adjust number of stitches on every round with double crochets so that number of stitches is divisible by 10 + 14 along each side (repetition increases with 2 treble groups in width every time it is repeated vertically - NOTE: With correct number of stitches every round after a round with double crochets will be worked as follows (beginning from the corner): 1 single crochet + 6 chain stitches + 1 single crochet around chain space in corner, * 5 chain stitches, skip 4 double crochets, 1 single crochet in next treble *, repeat from *-* until 4 double crochets remain before corner, skip these 4 double crochets, work 1 single crochet + 6 chain stitches + 1 single crochet around chain space in corner. Continue like this along all sides on square. AT THE SAME TIME when square measures approx. 36-38-40-42-44-46 cm x 36-38-40-42-44-46 cm / 14¼''-15''-15¾''-16½''-17¼''-18'' x 14¼''-15''-15¾''-16½''-17¼''-18'' work armholes as follows: Work A.5 as before until first corner, work around chain space as before. Now work chain stitches until the middle of next side (i.e. in the middle between first and second corner) as follows: Work 1 chain stitch for every chain stitch/treble skipped. 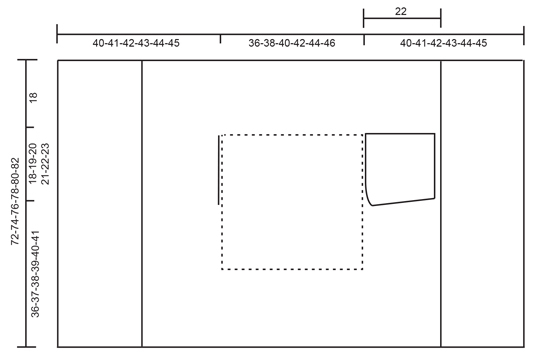 Then work pattern as before until the middle between 3rd and 4th corner. Now work chain stitches until 4th corner as follows: Work 1 chain stich for every chain stitch/treble skipped, work around chain space in corner and the rest of round as before. On next round work A.5 as before over all stitches again (i.e. 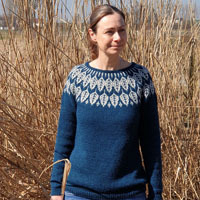 adjust pattern over armholes so that row is correct). Continue A.5 in the round until square measure approx. 72-74-76-78-80-82 cm x 72-74-76-78-80-82 cm / 28 3/8''-29 1/8''-30''-30 3/4''-31½''-32¼'' x 3/8''-29 1/8''-30''-30 3/4''-31½''-32¼'' (i.e. approx. 18 cm / 7'' from armhole in all sizes) – adjust to finish after a round with treble and so that number of stitches is divisible by 10 + 6 (including double crochets in the corners). Cut the yarn and insert 1 marker in piece (between first and second corner). A6A (= 1 stitch), repeat A.6B until 5 stitches remain on row and finish with A.6C (= 5 stitches). 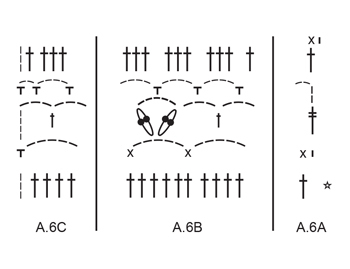 Continue pattern as shown in diagram and repeat A.6 until approx. 22-23-24-25-26-27 cm / 8 3/4''-9''-9½''-9 3/4''-10 1/4''-10 5/8'' have been worked back and forth from marker (finish after a row with chain spaces). Fasten off. Work the same way on the other side (i.e. work back and forth between third and fourth corner). Begin from right side and work a round with chain space around the entire piece as follows: Work * 6 chain stitches, skip approx. 2½ cm / 7/8'', 1 single crochet around chain space/in next stitch *, repeat from *-* but in each corner work 1 single crochet, 6 chain stitches, 1 single crochet. Fasten off. Work sleeve directly out from armhole on body. Work back and forth, top down and sew together when finished. Begin from wrong side mid under sleeve (begin on 3rd row in A.6 - i.e. on a row with small chain spaces). Work 1 slip stitch around first chain space, work A.6A 1 time, repeat A.6B 6-7-7-8-8-8 times in total and finish with A.6C 1 time. Continue A.6 back and forth (after next row there are 66-76-76-86-86-86 double crochets on row). 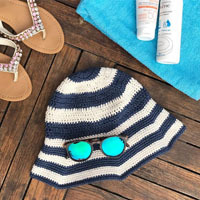 Then adjust so that there are 56-66-66-76-76-76 double crochets on next row with double crochets and finally 46-56-56-66-66-66 double crochets on row. When sleeve measures approx. 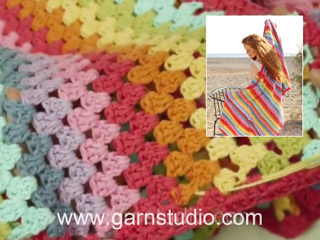 21 cm / 8 1/4'' in all sizes – finish after a row with double crochets in pattern, work first a row with chain spaces the same way as on row after a treble row in A.6. Turn piece and work last row as follows: 4 chain stitches, 1 single crochet around first chain space, * 6 chain stitches, 1 single crochet around next chain space *, repeat from *-* the entire row, work 2 chain stitches and finish with 1 single crochet in last single crochet on row. Fasten off. Work the other sleeve the same way in the other side of piece. Sew underarm seams edge to edge in outermost loop of edge stitch - make sure to avoid a tight seam. Buongiorno Laura, per realizzare questo modello nella taglia L deve seguire le istruzioni indicate e quando vengono riportati più numeri per la lavorazione (ad esempio quando il quadrato misura circa 36-38-40-42-44-46 cm) deve seguire il terzo numero indicato, che corrisponde alla taglia L. Buon lavoro! Buon giorno. Arrivata al DAVANTI ed una volta terminato il primo giro di A6, non corrisponde il numero corretto di archi per procedere correttamente il modello. Dag Lisanne, Nee, dat maakt niet uit. Het gaat erom dat je eindigt op een toer met lossenlussen en niet op een toer met stokjes o.i.d. Ik heb het vanuit het patroon verkeerd begrepen. Bedankt! Ik ben op het punt aanbeland waar ik in A5 bij de stokjes aan ben gekomen. In de omschrijving dat het aantal stokjes per zijde deelbaar moet zijn door 10 en 14, maar 74 is niet deelbaar door beiden! Hoe moet ik nu verder? Alvast bedankt. Dag Lisanne, Het aantal moet deelbaar zijn door 10+14, waarmee bedoelt wordt is dat het deelbaar moet zijn door 10 plus 14 extra steken. Dus 74-14 steken is 60. En 60 is deelbaar door 10. Finns denna med långa ärmar? Tyvärr finns den inte med långa ärmar. I believe the symbol chart has an error. The | symbol is listed as double crochet around a chain I believe it should be a double treble around a chain. It looks like a very long stitch on the garment. Dear Bonnie McC, it looks like you are right pattern should be edited soon. Thank you! Deze is ook prachtig, hopelijk wordt deze ook geplaatst.